We ask that you read it prayerfully. We need your help and your prayers now, more than ever. Thank you for making our important work possible. You are our strength, and we pray for you every day. 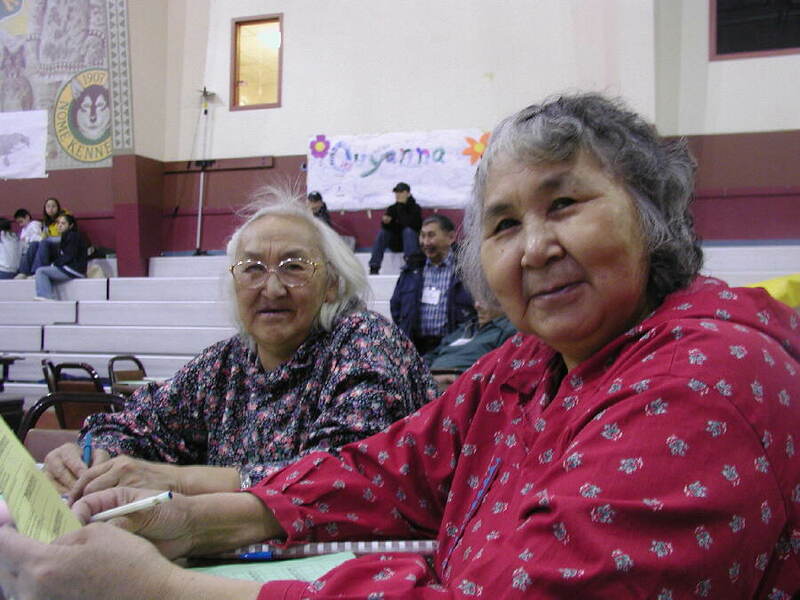 WELLNESS AND SOBRIETY: (left) Davis Sockpick of the village of Shishmaref was a speaker at the three-day Bering Strait Elders and Youth Conference. KNOM broadcast the entire three-day event live, giving folks for hundreds of miles front-row seats. Sockpick is a respected hunter, in a village where most food on the dinner table comes from the sea, primarily walrus, seal and polar bear. “Where there is life, there is hope,” Sockpick told the crowd and the KNOM audience, describing his recovery from addiction and urging young people to avoid alcohol and drugs, and seek strength from their family ties. Shishmaref is one of thirteen villages slated to receive a KNOM translator, a small local transmitter that will provide a clear signal to the isolated town of 594 souls. Recently, we are told that long unlistenable in Shishmaref, KNOM is now audible, but very scratchy. The residents of the village are greatly looking forward to the translator. On that topic, please see page 3 for some unsettling news. (Left) Clara (at left) and Rita Olanna travel from the village of Brevig Mission to participate in the conference. Among their roles is to chaperone the youth. 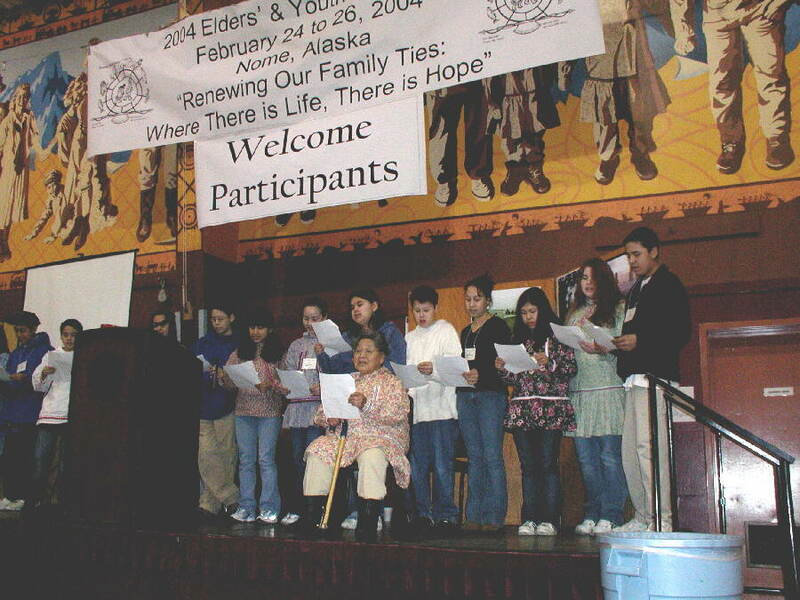 (Left) Esther Bourdon, sitting, leads the Nome Native Youth Leadership Organization in a traditional song. Esther is one of the planners of the conference. ONE DEGREE: Boston College has informed its 1969 graduate, KNOM general manager Tom Busch, that they will be conferring an honorary degree upon him at their graduation May 24th. As you can imagine, Tom is floored. LATE FLASH: If you are in the Boston area and would like to attend the graduation ceremony, followed by a special luncheon, please contact Tom before April 15th. He and Florence would be delighted to see you! KNOM is the oldest Catholic radio station in the United States, beaming strong, thanks to you. 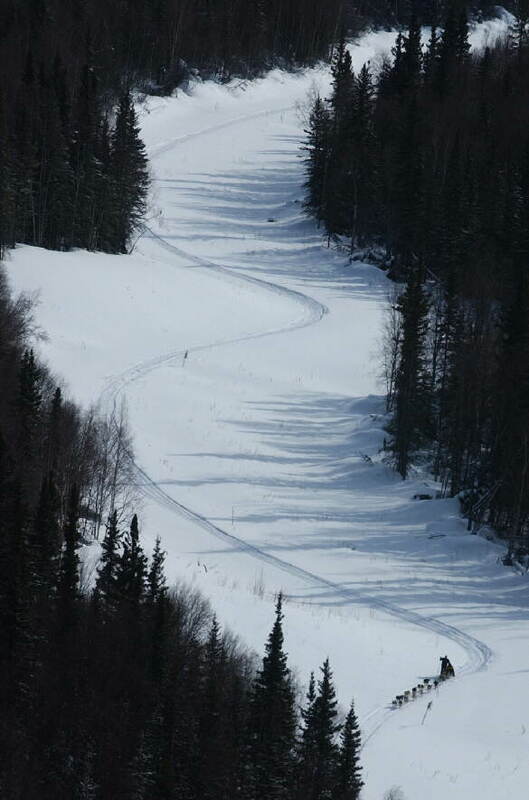 THE LONG AND WINDING ROAD (left): Three-time Iditarod champion Jeff King approaches the Athabascan Indian village of Ruby, about halfway into the 2004 Iditarod Race. KNOM has covered every Iditarod Race, and in great detail, since the first one in 1973. This year, news director Paul Korchin flew the trail, and KNOM covered every team’s finish as they reached Nome, 24 hours a day for nearly a week. What’s a Catholic radio station doing, broadcasting a sled dog race? The answer is that if we didn’t, we would lose many listeners this time of year, as almost every village where KNOM is heard has other radio choices. We also hope to pick up even more listeners, people who will tune in for Iditarod information, find they like our other programs and spots, and will stick with us. It’s really a breathtaking sight, watching a strong, happy, healthy dog team quietly padding on a wilderness trail. This stunning photograph is the work of Mark Lester/Anchorage Daily News. Ruby, incidentally, is one of thirteen villages in which KNOM hopes to install “translators,” which are low-powered transmitters to bring our signal into these places clearly. For these little stations the news is not the best. Please see the next page! RECENTLY SPOTTED: In addition to our inspirational spots, KNOM airs 34,000 educational spots every year. This past month, you’d hear spots on topics including: diabetes prevention, abusive relationships, dog bites, teen dating, grieving, the common cold, domestic violence, Alcoholics Anonymous, Al-Anon, women’s heart disease, exercise, U.S. history, Alaska history, science, television violence, and many more. These spots are an extremely effective way to reach the people who need to hear them most. Thank you! INSPIRATIONAL SPOT: Prayers are like seeds. It takes a while to see the results after they’re planted. Sometimes it takes months or years for an answer. Seeds start out small, but they end up fruitful, just like prayers. INSPIRATIONAL SPOT: Five minutes in the morning. Five minutes at night. That’s all my best friend asked of me, but it took me so long to get around to it. Years! I can’t imagine why it took so long. Those short periods of talking with God each day are now two of my favorite times of all. “SISTERS”: KNOM volunteer public affairs director Amy Flaherty has a new 12-year-old “little sister” Annie. Their relationship is part of Big Brothers Big Sisters, a nationwide program that combines kids who might need a little extra help in life with adults who are willing to mentor them. KNOM’ers Emily Barrett, Kelly Brabec and Anna Dummer are also Big Sisters. In June, Amy will complete her second volunteer year at KNOM. We are delighted to announce that at that time, she will be promoted to a full time salaried position at the mission. “ELDER VOICES”: We were delighted to premier this new, monthly half-hour program, each of which features an Alaska Native senior. It’s been long in the making; according to Amy Flaherty, who now heads the project, each show requires about twenty hours’ work. 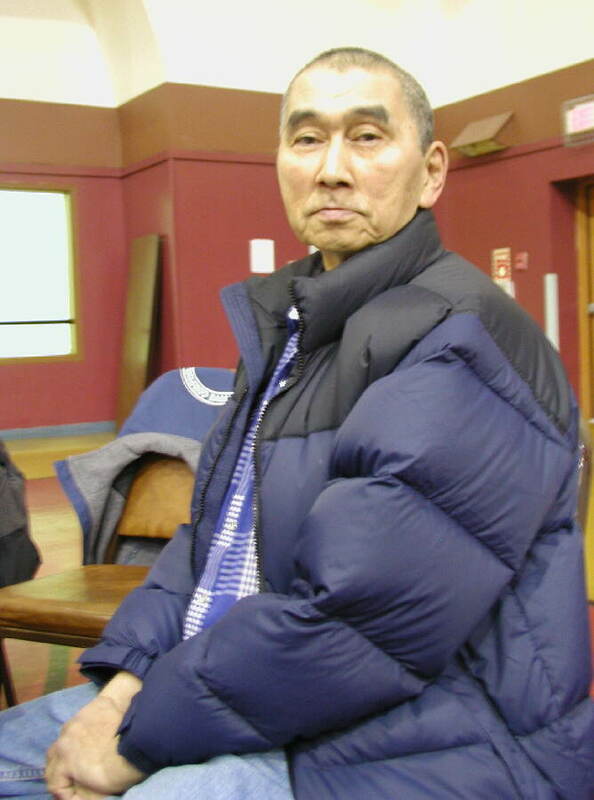 The first one featured Dan Karmun, an Inupiat (in-OO-pee-at) Eskimo who was born in the village of Deering, some 130 miles northeast of Nome. It was produced in 2002 by then-volunteers Julia Arrotti and John Hall. TRANSLATORS: March 16th, the FCC threw out all of our applications for village translator stations. According to consulting engineer Jack Mullaney, they were dismissed because the FCC refuses to allow us to feed our signal to them by satellite. We have until April 12th to appeal. For almost thirty years, the FCC has permitted satellite-fed translators in Alaska. In fact, there’s one in Nome, fed from the University of Alaska’s station in Fairbanks. So we are dumbstruck. As you know, many of these most distant villages have no reliable radio service at all, and we will do everything we can to have this decision overturned. Please pray, won’t you? Please consider adding missions like KNOM to your will. For most of us, it is the largest gift we are ever able to make. At KNOM, we place all bequests into funds that are used for emergencies, or major future improvements. INSPIRATIONAL SPOT: Peace comes when we pray to be able to forgive those who have hurt us or whom we don’t like, and we forgive as we have been forgiven. I dreamed of death last night, and heaven’s gate swung wide. An angel with a halo bright ushered me inside. as quite unfit, of little worth and spiritually disabled. Indignant words rose to my lips, but never were set free. For every face showed stunned surprise. Not one expected me! YOUR STAMP HELPS (left): It sure does! 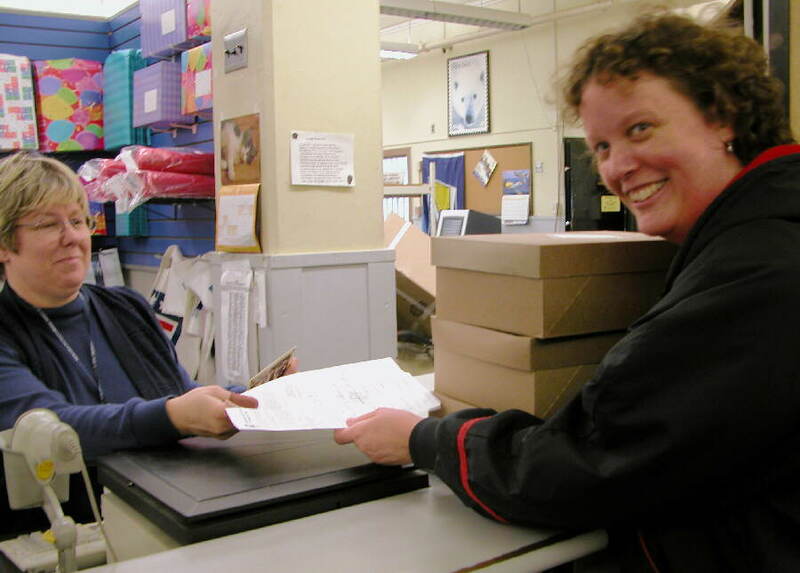 Here, KNOM’s Lynette Schmidt, at right, hands postal clerk May Barron three boxes of Business Reply envelopes on which KNOM supporters have placed stamps. We’re happy to pay postage for our friends who don’t have stamps, but this one batch represented an added donation to the mission of $1,472.69. Thank you! THIRTY YEARS AGO: Longtime volunteer business manager Therese “Tweet” Burik was the glue that held the station together, but she had vowed that she would never go on the air. On April 1, 1974, volunteer Roy Wells asked her to watch over things in Studio A for just a few moments while he stepped out. Except for Tweet, the building was empty. Ten minutes, twenty minutes later, no Roy. And so, terrified, Tweet deejayed her first show. It couldn’t have been too bad, as she then agreed to do an hourly show each day for the next several weeks. As you’ve read, the last few weeks have been eventful for us, providing more than our share of ups and downs. We have offered prayers of thanksgiving and prayers of sorrow. We thank you sincerely for your financial and moral support, and especially for your prayers, which we greatly need. We pledge to continue working as hard as we can, and as frugally as we can, to carry the message of the Gospel, as well as providing temporal healing, to the thousands of scattered souls in western Alaska. “Quianna” (kwee-AH-nah) is an almost universal Eskimo term for “thank you. Quianna! Quianna! May God greatly bless you for your thoughtfulness and generosity.